Last Friday, our student Iliyana Ivanaova has successfully defended her master thesis "Mobile Web Services for collaborative Learning". I supervised Iliyana’s thesis together with my dear colleague Satish Srirama. The goal of the thesis was to bring together the research areas of collaborative learning and mobile web service provisioning. The thesis combines the latest developments in the related research domains: collaborative learning, mobile learning, mobile social software, and mobile web service provisioning. The outcome of this thesis was the design and implementation of the MobileHost CoLearn system which implements different modules to support web services based mobile collaborative expertise finding for learning. 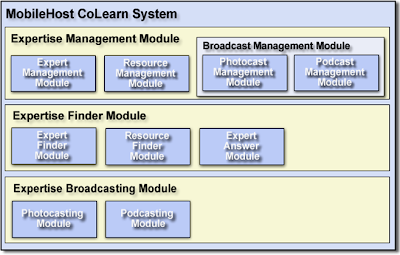 The MobileHost CoLearn system presents a novel approach to expertise finding within a truly collaborative mobile learning environment, including expert finding, literature resource retrieval and multimedia resource broadcasting, based on web service provisioning from mobile phones. The system enables the users to find experts in particular fields, who can provide them with exactly the information that they need and who can solve the specific problems they encounter. The discovery of experts is not targeted only within the framework of the user's social network, but also within the social networks of her acquaintances, and the social networks of the acquaintances of her acquaintances, and so forth. Such an expert finder flow will usually lead to the discovery of more than one potential expert, and the user's subjective decision who of them is the most knowledgeable one can be based either on the rating for the expert's level of expertise in the field, or on the path that the expert finder request has travelled before reaching the respective expert. After having found an expert, the user is provided with all the necessary information in order to be able to contact her for further assistance and to ask her questions regarding particular issues. Alongside the valuable knowledge that flows within the system from the experts to the non-experienced users, the system supports the retrieval of a variety of resources. Among the most valuable literature types for each learner are the articles, inproceedings, proceedings, books, URLs, master and PhD theses, and unpublished resources. For the easy retrieval of specific resources, users should be able to tag them with particular keywords, and, as tagging is subjective and relevant, the user should be provided the opportunity to set the relevance of a tag to a resource. For this purpose, a three-level scale of relevance of a tag to a resource is employed. Except retrieving specific resources at the time when they are needed, the system maintains image and audio resources within photocasting and podcasting channels, through which they are automatically distributed to all subscribers, as soon as they become available. This is one of the most suitable ways for sharing up-to-date knowledge, as the amount of information that can be conveyed through such broadcasting channels is enormous. In addition to employing the tagging mechanism, the leaving of feedback to broadcast resources should be also available, as well as the opportunity to retrieve the comments, that other learners have left for a resource. Regarding the technical aspects, the MobileHost CoLearn system is based on the concept of web service provisioning from mobile phones. It takes full advantage of the latest developments in the telecommunication domain in terms of transmission rates and resource capabilities. The networking technology, which is used for communication between the web service provider and web service requesters, is GPRS, as it provides excellent speed, four times faster than GSM, and allows learners to be always connected, so that services are quick and easy to access.